Update April 6, 2018: The app has received a couple of updates that have resolved problems 1 (calling notifications), 2 (Teams is too quiet), and 4 (speed and stability is an issue). Update April 24, 2018: Another update has come through that has resolved Problem 6 (Cannot share screens on mobile devices). This is a short introduction to how me and my team got started using Microsoft Teams app, our first impressions, our teething issues, and how we feel about it. If you want to see what other suggestions I’ve made, they’re at Better Software Suggestions. If you want to see what other suggestions other people have made, they’re at User Voice. I want to share an email I sent to the company. The way we communicate is incredibly important and change can be hard. I’m very proud of the way the guys continually embrace change. This is a change that you might want to make in your organisation too. A few of us have been trialling Microsoft Teams for many weeks and I believe it is now ready for everyone at SSW to join the fun. To start with please do *all* Daily Scrums with Microsoft Teams instead of using Skype. That will be a good start. If you are happy then continue to expand your use of Microsoft Teams. 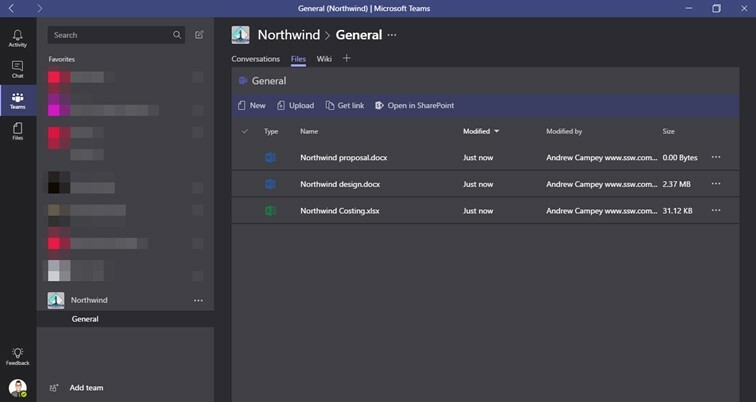 Making collaboration as simple as possible has always been a fundamental need SSW and Microsoft have released Teams to help make this easier. As with Skype, users can communicate directly to other staff members via the “Chat” tab or, now you can use the “Teams” tab to have a similar conversation with the group you’re working with. Tabs simplify collaboration – this is the big one! When you’re having a discussion about the Northwind ordering system that you’re building, you need to see your backlog, and of course it would be handy to see a OneNote diagram of the workflows. It might also be handy to see an Excel spreadsheet of the stakeholders and testers. This is what separates Teams from other chat programs, such as Slack and Skype, is the ability to add Tabs to your conversations. The number of tabs is really broad, and starts with the standard Microsoft products such as Excel, Word, and PowerPoint. You can also create tabs using Trello, YouTube, Zendesk, and more. The usefulness of this feature cannot be understated – it is so handy to have all your work items in one place. You can see that Teams tabs are a one-stop shop for all the information your team could need. Like Skype, video chat is standard and is great for doing your daily Scrum with the team or quick face-to-face conversations. Inbuilt third party integration – YouTube, Trello, Zendesk, etc. Pretty much everything you’re doing on Slack today can be done on Teams. You don’t need to navigate to your files at projects.ssw (our SharePoint 2016 document library) any more. Instead, navigate to the “Files” tab in Teams (isn’t ‘Files’ a better name than ‘Documents’!). Plus it is basically the same as what we have always used – just now an Office 365 Document Library. If you’re both on a laptop and want to share screens, Teams works fine. As soon as the ‘external’ feature comes that will change too. What are your suggestions for the Microsoft Teams developers over in Seattle? I think, long term, that Teams is going to be amazing, but it’s not perfect (yet!). I’ve been sending many emails of my complaints to the guys working on Microsoft Teams. They have been incredibly responsive and fixed heaps of issues just in the last month. The notifications when someone’s calling you must work as well as Skype – and right now it doesn’t– sometimes on my PC I can hear it calling but can’t find the button to answer, and have to go fishing through my windows to find the one to answer. Why is this notification for a team shown in the “Activity” and not the “Teams” group? Why do we have the “Activity” tab at all? I don’t think it’s needed. The iPad app is solid. The PC app feels less so. Switching between conversations is appreciably slower than with other chat programs – granted it’s only nanoseconds, but it’s enough to be noticeable. Worse still, occasionally the app hangs completely. It seems that if you lose internet connectivity, the app crashes… which leads me to my next wish list item. What I loved in Skype is I could send messages when I was offline, and when I reconnected to the internet, those messages would send. Most of the time, I don’t use a laptop. I spend most of my days running between meetings and offices (currently, I’m on holiday in Greece), so I find it easier to use an iPad, but I’ve found one big drawback to this with Teams: There’s no support to share screens on mobile devices. When I’m on a call with a developer, they’ll often share their screen with me so we can discuss the specifics of their app or code. For that, we currently have to switch back to Skype. We can mostly use Teams instead of Skype or TeamViewer on a PC. I can even use Skype screen sharing on my iPad, but, sadly, not with the Teams app. On Skype for Business, we are federated with Microsoft and other companies and we need the same functionality to contact new people. Currently with Teams, we can only contact people within our own organisation. With SharePoint 2016, we had a nice custom URL for our files. With Files in Teams, I’d like to be able to do the same.